Strep throat could not stop this wedding. Andrew came down with a terrible case of strep throat one day before he was to wed the love of his life, Debbie. Traveling from Scotland the couple enjoyed a few days in Orlando before they arrived at Paradise Cove for their intimate destination wedding. Surround by family and friends they recited their vows and exchanged wedding rings in a beautiful civil ceremony. Chris from Cricket’s Photo and Video captured every detail from the the bride getting ready through to the cutting of the cake. Amy from Blossoms created a beautiful bouquet for Debbie and decorated the wedding arch in draped fabric and bunches of blush colored roses. Daniel from Paradise Cove coordinated the entire event. 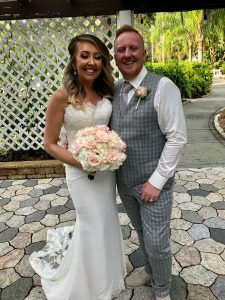 Rehttps://www.sensationalceremonies.com/locations-weddings/central-florida/rev-glynn-ferguson/v.Glynn Ferguson with Sensational Ceremonies created a custom ceremony to fit the two of them. Their only real request was that they wanted traditional vows, a civil ceremony, and it had to be long enough to their guests knew it was a wedding, but short enough to keep everyone engaged.